There’s nothing more peaceful than watching your brand new baby sweetly slumbering, but first you need to decide just where she’ll lay her precious head. From the early days to new sleep frontiers beyond the baby stage, here’s our guide to when you can expect your baby to transition, paired with some of the most stunning bassinet, cradle, cot and junior bed options on the planet. Once you bring your fresh little bundle home, there are a couple of decisions to make about where your baby will sleep. And sometimes, you’ll find that your baby just doesn’t like where you’ve decided they should sleep, so be prepared for a little trial and error! Above all, safety is key – so make sure you read and follow the Safe Sleep Guidelines from Sids and Kids. This includes ensuring your baby sleeps on his back from birth, and it’s recommended that babies have their own safe sleeping place, in the same room as an adult or caregiver for the first six to 12 months. There are plenty of choices when it comes to creating a sleep space for a newborn, each of them so adorable that it might be hard to choose. Your tastes might lean towards the traditional Moses basket, which is supremely portable and classic in style. Or you might prefer a free standing bassinet (on a stand) which are available in both traditional and streamlined, modern styles. If you choose a bassinet with wheels you’ll be able to easily move it around the house with you. For those who would prefer to co-sleep with their baby, we must make mention of the versatile Bednest (pictured above). It can be used as a co-sleeper, by positioning the mesh side down, or as a traditional bassinet with both sides up. Like bassinets, cradles generally have a more compact footprint than a standard cot, although your baby will grow out of them and require a regular cot eventually. Their biggest advantage (besides being stunning) is that usually you can rock or swing them, which may help to settle a restless baby. The Leander Cradle (pictured below) is a rarer breed – a hanging cradle, which has a natural swaying motion that (hopefully) gently lulls baby to sleep. 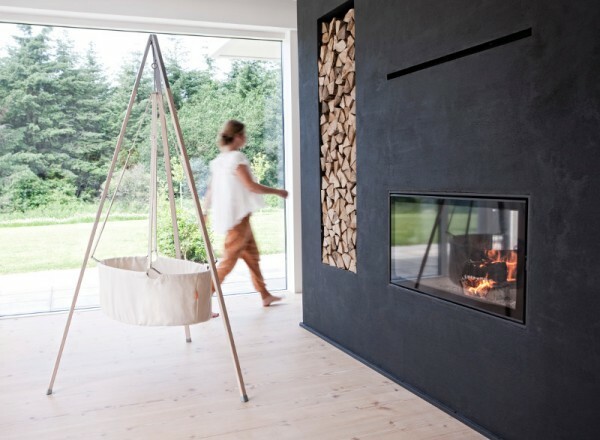 You can suspend it from its own tripod, or hang it from the ceiling – which frees up floor space and looks pretty fabulous to boot. Babies can show they’re ready to move to a cot at different ages, so you’ll need to take the cues from your own bub. However, they generally need to moved out of a bassinet or cradle once they can pull themselves into a sitting position. 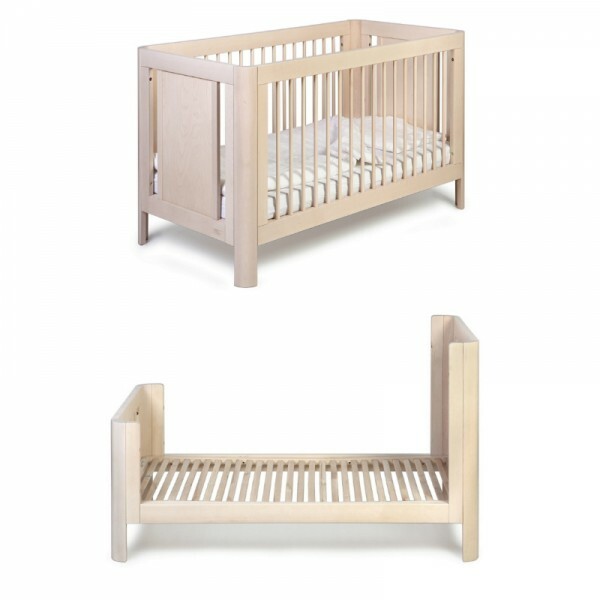 When choosing a cot there is more to take into account than you might expect! Would you like drop down or fixed sides? Would you prefer closed or open ends (which will limit or increase your baby’s line of sight)? Also, these days you’re not limited to a standard rectangular cot anymore. Oval cots and cots with rounded edges will sometimes be the answer in tricky spaces. Would you like the cot to be convertible? There are an increasing number of convertible cots on the market, like the Leander Cot (pictured above) which you can configure five different ways, from cot size to junior bed in stages. Speaking of junior beds, they’re a great option for little people who might feel swamped in a standard single bed (and don’t really need that much room yet anyway). And although there are certainly cheap versions on the market, a junior bed doesn’t have to sacrifice style. Check out the Scandi beauty of the Troll Sun Cot (below, in its two variations) which will just keep giving through your baby’s childhood. It transforms into a compact junior bed that plenty of parents would be happy to take a kip in! The other plus of investing in a future junior bed is that your child’s room will still have plenty of space for play (or for multiple beds, if you have a few kids in one room), because these smaller beds have a compact footprint. There are so many incredible options for baby sleep nests that strike a balance between form and function. It can take a while to figure out just how and where your baby likes to sleep, so investing in a versatile piece of nursery furniture is one of the best ways to ensure sweet slumbers!